The Diversity, Outreach and Inclusion Office will be offering two a one day summer experience for rising junior and senior High School students for the 2019-20 academic year. The program will introduce prospective students to careers and opportunities within engineering through hands-on and interactive learning. Students will experience engineering from a humanitarian perspective and learn about the engineering design build process and team work as relates to consumer safety. Students will also receive important information on the college application process as well as financial aid and scholarships. For questions or concerns, please email Ivette . The Translational Data Analytics Institute hosts a free summer camp that introduces 35 young women in grades 8-10 to data science and analytics-an exiting, fast-growing field centered on scientific methods and processes for extracting new knowledge from data. Students who learn these skills can combine them with an unimaginably wide range of interests, from business and biology to health care and education, to city planning and social serivces and they are in high demand by employers. The Summer Engineering Institute (SEI) will provide opportunities to explore the fundamentals of engineering. The SEI will introduce students to a variety of engineering areas and engineering fundamentals. Topics inclde engineering design process, teamwork skill, elements of problem solving, and engineering professionalism and ethics. The STEM Summer camp focuses on exploration in science and engineering topics. 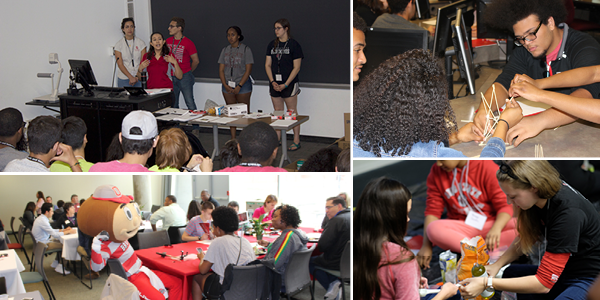 Camp attendees will experience sessions in mathematics, problem solving, biochemistry, engineering and robotics while working directly with Ohio State Marion faculty, undergraduate peer mentors, and local high school teachers. Summer Engineering Camp for Middle School Girls provides an opportunity for middle school girls to participate in hand-on projects to broaden their knowledge and skills. Attendees will explore different majors and become familar with various engineering disciplines with an ultimate goal of making informed decisions and building pathways into high school engineering courses. July 22-26, 2019 9 a.m. - 4 p.m. There is no charge to participate in this camp, however space is extremely limited! The deadline to apply is May 1. Transportation to and from camp will be available on a need basis. Questions: Please call 614-292-5990 or email .